Soooo…not the greatest start. 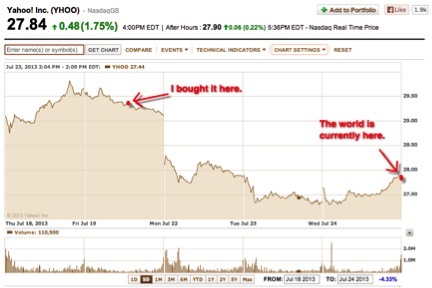 Good thing I’m not a day trader. ALSO READ: Tweet Your Earnings! Since I bought YHOO last Friday (which I oh-so-wonderfully describe in my previous blogpost), the price has dropped nearly 5%. Since it’s the only stock I’m currently holding in my Practice Portfolio, my entire Practice Portfolio has dropped about 5%. No, I didn’t have two first points as to why Yahoo fell and forgot to include them in this post. Third Point is the name of a hedge fund that just sold 40 million shares of Yahoo, bringing its stake in the company down to less than 2%. The head of Third Point, billionaire investor Daniel Loeb, is also stepping down from the company’s board. See Mr. Loeb is what’s known as an “activist investor”, which means that he doesn’t just make an investment and let it ride; he gets involved in the company. This is exactly what Loeb did. He joined the Yahoo’s board, and played a role in the management shake up of the company, which included appointing ex-Google employee Marissa Mayer as the new CEO about a year ago. But most activist investors don’t stay long. They get in, make their mark, and get out hopefully at a profit. That’s what Loeb has done here, getting out right after Yahoo announced strong earnings and their stock shot up 8%. Ok, so now it’s time to grow that portfolio of mine. I only got one measly stock sitting in there. 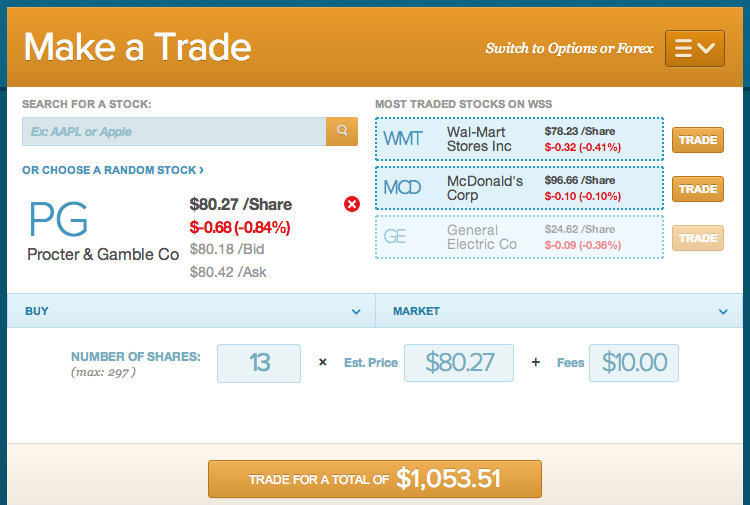 And if the Basics of Diversification Course has taught me anything, it’s that holding too few stocks is way too risky. Especially a tech stock. With constant and rapid innovation, tech companies are always changing and adapting, or else they’re dead. So holding stocks in this sector comes with a lot of risk. Thus, I think I ought to diversify by industry, and invest in a company in a completely different sector. So if we enter Tech Bubble #2, not all my investments will be toast. I’ve decided to go with the consumer staples industry, since it’s considered a pretty safe sector of the economy. Consumer staples are all those essential products that we need to live: food, beverages, household items, etc. Proctor & Gamble is a leader in the consumer staples industry, with an array of product lines such as: Dawn, Tide, Oral-B, Gillette, Duracell and many more. Most of the essential items’ brands that you know of, they own. As I said, diversification: Warren Buffet says, “Diversification is protection against ignorance.” He claims that you only need to diversify if you don’t know enough. Even though I’m around tech stock news all day everyday, I can still easily admit to myself I don’t know enough. So…diversification it is. Safety: The company is strong. They’ve been around since 1837. And the products that P&G sells are not only very well known, they’re also necessities. Even when the economy isn’t doing so well, these products are still being bought. You still need to brush your teeth in a recession, don’t you? Steady Income: Proctor & gamble pays a dividend, and a healthy one at that. Their dividend yield is currently 3%. This means that if they were to announce a dividend payout today (with the stock price currently at $80.27), they’d pay a dividend of $2.41 per share. Multiply that by a few thousand shares, and that’s some nice investment income. Not only that, but the company’s payout has steadily increased for the past 57 years straight. Growth: This is not some old, boring grandfather of a company. They’re huge on innovation and market growth. 65% of their sales are coming from outside of the U.S., with huge growth potential in emerging markets. Also, as the U.S. economy improves, people are switching back from no-name brands to their P&G favorites. Warren Buffet owns it: ‘Nuff said. Done and done! Now my portfolio is rocking 2 amazing stocks from 2 amazing companies: Yahoo and Proctor & Gamble. 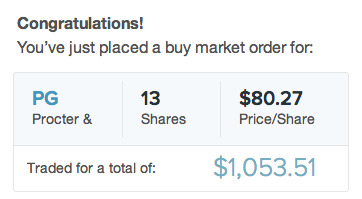 Tune in next week to see how my investments are doing, and check out my third stock choice. Next articleWe’re Making Your Portfolio Page Better!